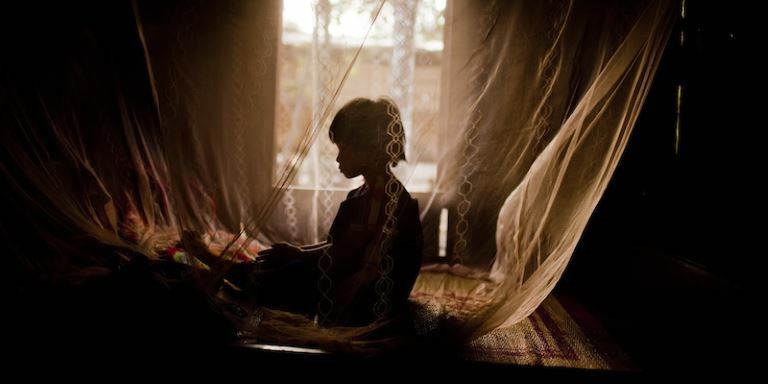 Mosquito nets protect children against malaria in Viet Nam. Photo credit: Justin Mott/ADB. More than 2 billion people in Asia and the Pacific are at risk of contracting malaria and nearly 50,000 die annually from the disease. The region is facing the threat of drug resistant malaria, which complicates the malaria issue. Yet malaria elimination in the region is technically feasible and necessary in order to tackle drug resistance malaria. The strategy to achieve it promises a range of other positive health outcomes through the strengthening of health systems and the improvement of regional health security. The Regional Malaria and Other Communicable Disease Threats Trust Fund (RMTF) works on the premise that a “business-as-usual” approach to malaria elimination is bound to fail. Instead, the RMTF is working with countries in the region to develop multicountry, cross-border, and multisector responses to the disease. Asia and the Pacific leaders have taken a concrete step closer to defeating malaria by endorsing a detailed plan to eliminate the disease throughout the region by 2030. Why is it important to eliminate malaria? With more than 2 billion people at risk across the region, malaria remains a major killer. Close to 50,000 people in the region die from malaria annually, with the potential for this to more than double should there be a resurgence. Malaria imposes a huge drain on health resources; it also degrades productivity, undermines household income and reduces child learning. It is also a brake on the development of poorer regions, discouraging tourism, agriculture, and industry. Why is malaria still a problem in Asia and the Pacific? Malaria is difficult to eliminate because it is tenacious and knows no borders. It thrives in the face of weak health systems and develops resistance to proven treatments. Most recently malaria is showing growing resistance to artemisinin-based combination therapy, the last line of simple-to-use and effective malaria drugs. Artemisinin resistance in the Greater Mekong Subregion (GMS) has been detected in five countries: Cambodia, the Lao People’s Democratic Republic (the Lao PDR), Myanmar, Thailand, and Viet Nam. In addition to drug resistance, there are a number of other issues that make malaria elimination difficult. These include suboptimal delivery of malaria treatment (in particular for mobile and migrant populations), the lack of timely and comprehensive disease surveillance, inadequate cross border cooperation, and the high number of substandard and counterfeit medicines and other health commodities on the market. Yes. Malaria elimination is technically feasible in Asia and the Pacific, and the strategy to achieve this goal promises a wide range of other positive health outcomes through the strengthening of health systems and improved regional health security. What's the best strategy to get rid of malaria? Malaria elimination cannot be achieved without strengthening weak health systems. But as strong health systems are not quick or easy to develop, malaria-specific programs should also be supported. A higher level of sustainable financing. Cooperation to ensure supplies of quality, affordable, and effective malaria drugs and commodities. Improved data from health information systems for evidence-based decision making. Stronger implementation of national malaria and other communicable disease threats programs. An expansion of leadership that looks beyond the health sector. The RMTF expects to achieve the following targets when its first round of financing expires at the end of 2017. Increased financing for malaria and other communicable disease threats. Better quality drugs and commodities. Better use of information and communication technologies. Improved national capacity to detect and treat drug-resistant malaria and other disease threats. Inclusion of malaria and communicable disease prevention in large commercial and development projects. If malaria knows no borders, what’s happening at the regional level? The RMTF fosters cross-border collaboration, for example on pharmaceutical regulatory convergence and disease surveillance. It is introducing innovative strategies—such as applying call data records and geographic information systems (GIS)—to improve surveillance of mobile populations and identify high transmission areas. It is strengthening national health systems, working to regulate pharmaceuticals, and introducing e-health tools for more effective health information systems and health sector management. Fund resources are also helping reduce the risk of malaria through regional capacity development programs, stand-alone projects, and grants included in investment packages. Which countries are eligible to receive RMTF funds? The fund prioritizes the Greater Mekong Subregion (GMS) due to urgent need to tackle drug-resistance malaria. That’s because while it's important to tackle malaria everywhere in the region, an Asia and the Pacific free of malaria is only achievable by 2030 if the problem of multidrug resistance is vigorously addressed in the GMS countries. The RMTF's financing partners are the Government of Australia (Department of Foreign Affairs and Trade), the Government of Canada (Department of Foreign Affairs, Trade and Development), and the Government of the United Kingdom (Department for International Development). Malaria elimination is an obvious public health best-buy that will reduce human suffering and foster economic gains through increased worker productivity, improved educational outcomes, and a more vibrant tourism sector. Elimination will also yield longer-term savings through reduced health care costs and the creation of more robust and sustainable health systems. Asian Development Bank (ADB). Regional Malaria and Other Communicable Disease Threats Trust Fund (RMTF). ADB. 2015. Malaria Elimination. Mandaluyong, Philippines. ADB. 2014. Ben Rolfe on Historic Agreement to Eradicate Malaria. Changing Asia video series. 14 November.